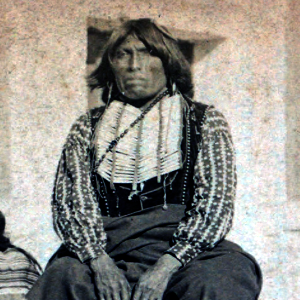 The last Indian raid in Texas began when Black Horse and his renegade band of Comanches, camped in Yellow House Canyon in 1877 in Lubbock County to hunt buffalo. They ended up hunting white buffalo hunters instead. When they spotted buffalo hunter Marshall Sewell below the Caprock in Garza County, they tortured and double-scalped Sewell before cutting open his stomach and placing pieces of his rifle tripod in the wounds. The murder was witnessed by another hunter and several skinners who reported the atrocity at the nearest settlement of Rath City..
An enraged group of 46 men set out from Rath City on March 4th to capture Black Horse and his band. After killing a Comanche sentry at Buffalo Springs Lake they they found the Black Horses campsite at a site now marked by Lubbock Lake. The Texans attacked but were quickly forced to retreat after suffering a dozen wounded or killed. When word of the battle reached Fort Griffin, Captain P.L. Lee reacted by going after Black Horse and his Band with 72 "Buffalo Soldiers" of the 10th Cavalry. They caught up with the Comanche's at Quemodo Lake in Cochran County. A brief skirmish ensued which resulted in which the Comanches surrendered and were returned to Fort Sill in Oklahoma. Black Horse returned to the reservation and settled down for the rest of his life. He died on the reservation at Cache, Oklahoma Territory in 1900.